Since Fidel Castro’s ascent to power in 1959, U.S.-Cuba ties have endured a nuclear crisis, a long U.S. economic embargo, and persistent political hostility. The diplomatic relationship remained frozen well beyond the end of the Cold War but moved toward normalization during the administration of U.S. President Barack Obama, whose policies have been partially rolled back under President Donald J. Trump. 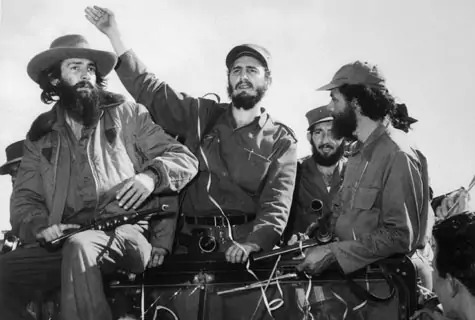 Fidel Castro establishes a revolutionary socialist state in Cuba after he and a group of guerrilla fighters successfully revolt against President Fulgencio Batista. Batista, who had been supported by the U.S. government for his anticommunist stance, flees the country after seven years of dictatorial rule. 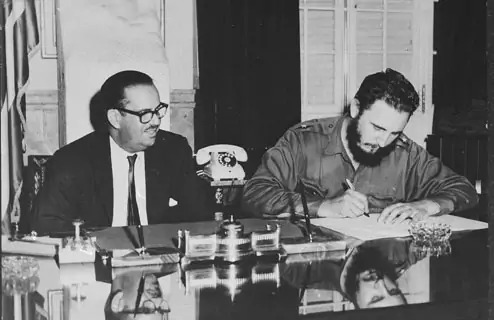 Castro gradually strengthens relations with the Soviet Union. Castro nationalizes all foreign assets in Cuba, hikes taxes on U.S. imports, and establishes trade deals with the Soviet Union. President Dwight D. Eisenhower retaliates by slashing the import quota for Cuban sugar, freezing Cuban assets in the United States, imposing a near-full trade embargo, and cutting off diplomatic ties with the Castro government. Executing a plan developed and approved by the Eisenhower administration, President John F. Kennedy deploys a brigade of 1,400 CIA-sponsored Cuban exiles to overthrow Fidel Castro. The Cuban military defeats the force within three days, after several mishaps disadvantage the invaders and reveal U.S. involvement. Despite the failed invasion, U.S. administrations over the next several decades conduct covert operations against Cuba. The Kennedy administration imposes an embargo on Cuba that prohibits all trade. Cuba, whose economy greatly depended on trade with the United States, loses approximately $1.126 trillion over the next fifty years, according to Cuban government estimates. U.S. spy satellites discover that Cuba has allowed the Soviet Union to build nuclear missile bases on the island. In response, Kennedy demands the Soviet weapons be removed and orders a naval quarantine of Cuba, igniting a thirteen-day standoff. With the threat of nuclear war on the horizon, the United States negotiates with the USSR via back channels. 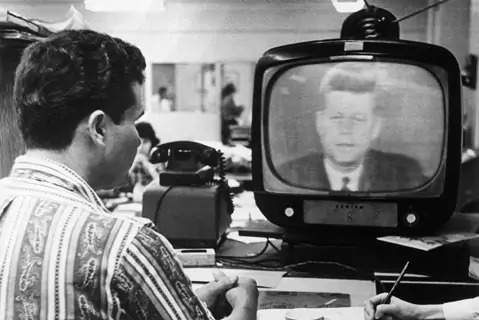 As the crisis nears its third week, Kennedy secretly agrees to withdraw U.S. nuclear missiles from Turkey within a few months if the Soviet Union withdraws its missiles from Cuba. Kennedy also pledges not to invade Cuba. Soviet Premier Nikita Khrushchev accepts the deal and announces that he will order the missiles removed. The following July, Kennedy prohibits U.S. nationals from traveling to Cuba. Castro indicates in a September 1965 speech that Cubans can leave for the United States of their own free will, saying that “nobody who wants to go need go by stealth.” Days later, President Lyndon B. Johnson announces he will open U.S. borders to all Cubans and signs into law an immigration bill that gives preference to Cuban migrants with family ties to U.S. citizens or residents. The U.S. State Department estimates that some 270,000 Cubans have arrived in the United States since Castro took power. In November 1966, Johnson enacts a law that allows Cubans who reach the United States to pursue permanent residency after one year. President Jimmy Carter reaches an agreement with Castro to resume a limited diplomatic exchange, allowing officials from the two countries to communicate regularly. The United States opens an interests section with a small staff in its former embassy in Havana under the auspices of the Swiss embassy. Switzerland had taken over U.S. interests in Cuba in 1961. Meanwhile, Cuba opens an interests section in Washington, DC, under the auspices of the embassy of Czechoslovakia. 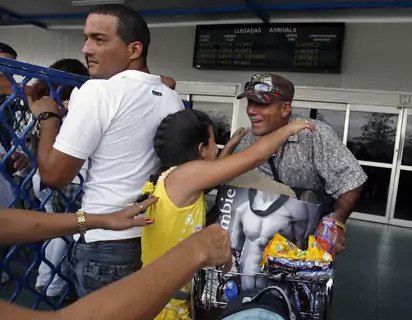 Cuba faces intense pressure from thousands of Cubans hoping to flee the country as its economy suffers from a spike in oil prices and the continued U.S. embargo. 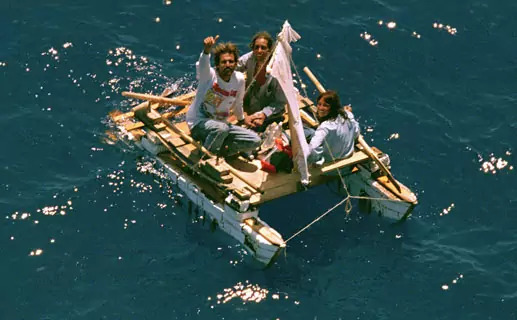 Following a forty-eight-hour debacle in which ten thousand Cubans crowded at the gates of the Peruvian embassy to gain asylum, Castro states that anyone wishing to leave Cuba for Florida may do so from Mariel Harbor over the next six months. 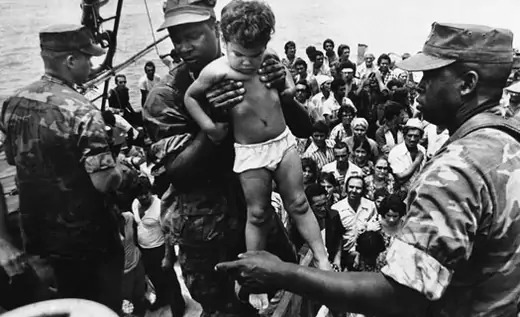 President Carter welcomes Cubans to the United States “with open arms,” and as many as 125,000 Cubans take part in the boatlift. President Ronald Reagan designates Cuba a state sponsor of terrorism, censuring the Castro government for providing support to militant communist groups in African and Latin American countries including Angola, El Salvador, Guatemala, and Nicaragua. 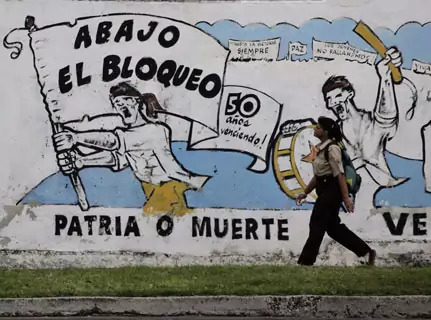 Cuba maintains that “acts by legitimate national liberation movements cannot be defined as terrorism,” according to a U.S. State Department report. Due to the heavy economic sanctions already in place, the designation is largely a symbolic act. Radio Marti begins broadcasting news and entertainment programming to Cuba from studios in the United States. The federally funded station was proposed by Reagan in 1981 and created by Congress two years later. The Cuban government condemns the service as U.S. propaganda, jams the new station’s broadcasts, and calls its use of independence hero Jose Marti’s name a “gross insult.” Castro suspends an immigration agreement that would have allowed up to twenty thousand Cubans a year to immigrate to the United States and provided for the repatriation of some three thousand Cubans with criminal records or who suffer from mental illness. 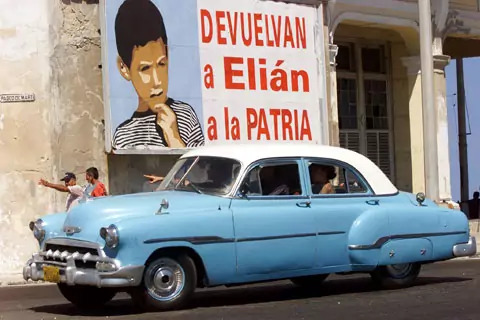 Cuba also halts visits by Cubans living in the United States. President George H.W. Bush signs the Cuban Democracy Act, which increases U.S. economic sanctions on Cuba. 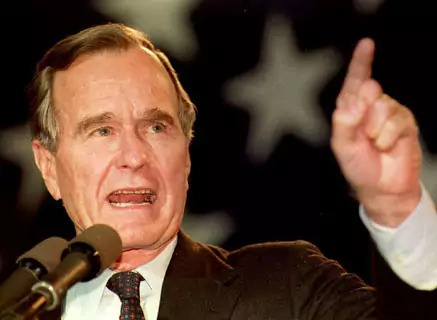 The move follows the Soviet Union’s 1991 collapse, with Bush stating that Cuba’s “special relationship with the former Soviet Union has all but ended. And we’ve worked to ensure that no other government helps this, the cruelest of regimes.” The statute bars vessels that have exchanged goods with Cuba in the previous 180 days from docking at U.S. ports and prohibits foreign subsidiaries of U.S. businesses from trading with Cuba. The legislation also limits the amount of U.S. currency traded with Cuba. 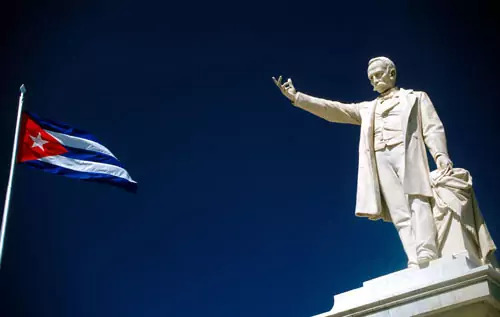 The act does, however, offer a path to normalizing relations that is conditioned on Castro’s government making significant economic and political reforms. Havana and Washington implement two accords aimed at addressing the thousands of Cubans attempting to enter the United States annually. 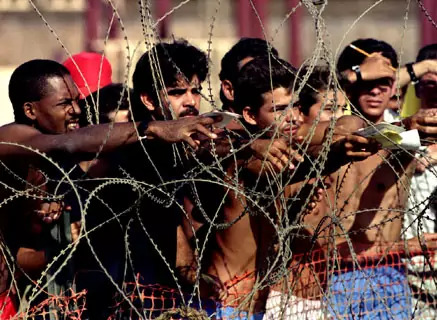 The first follows an abrupt policy change by President Bill Clinton in August 1994 that calls for all Cubans rescued at sea to be brought to the U.S. naval base at Guantanamo Bay. 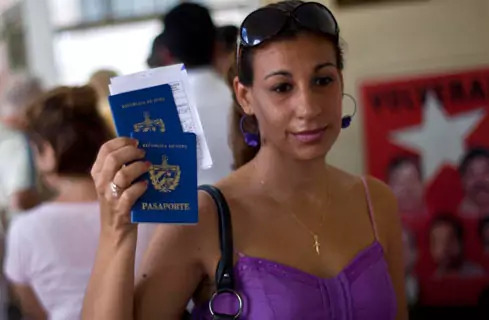 It outlines terms for future legal immigration from Cuba to the United States, setting the number of Cubans allowed to enter the U.S. annually at a minimum of twenty thousand (not including immediate relatives of U.S. citizens). The second accord establishes the "wet foot, dry foot" policy, in which Cubans intercepted by U.S. authorities at sea are sent home while those who make landfall in the United States are allowed to remain and pursue permanent residency after one year. The agreement also allows for more than thirty thousand Cubans detained at Guantanamo Bay to enter the United States on parole status. 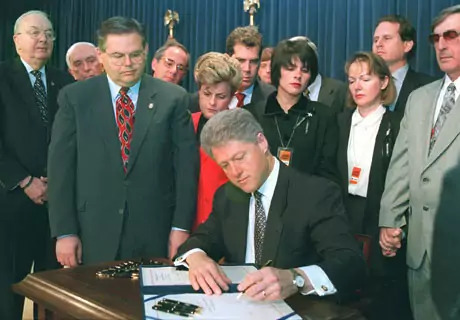 Clinton signs the Cuban Liberty and Democratic Solidarity Act, better known known as the Helms-Burton Act, which tightens and codifies the U.S. embargo. It comes several weeks after the Cuban military shot down two U.S. civilian planes over waters off of Florida. Among other provisions, the statute penalizes foreign companies that do business with Cuba, provoking some U.S. allies to denounce it as a violation of international law. 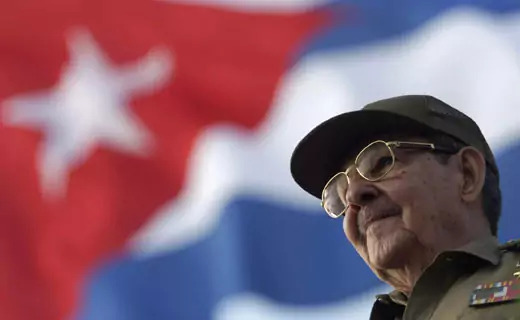 The law stipulates that sanctions may only be lifted after Fidel Castro and his brother Raul are no longer in office, Cuba has moved toward free elections and a free press, and it has released political prisoners. The Clinton administration charges five Cuban counterintelligence officers in the United States with conspiracy to commit espionage, among other illegal activities. 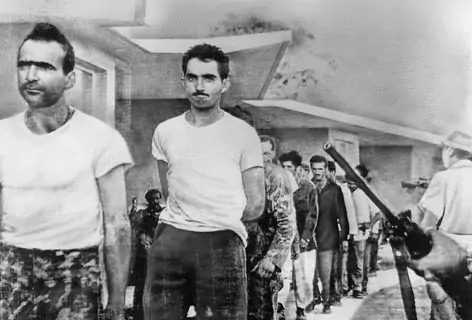 The officers, who were sent by the Castro government to infiltrate Cuban-American exile groups in Miami, are arrested in 1998 and found guilty in 2001. Two are released at the end of their terms, in 2011 and 2014, and the remaining three are released on December 17, 2014, as part of a prisoner swap for a U.S. intelligence officer held in Cuba. The case of five-year-old Elian Gonzalez, the sole survivor of an attempt by his mother and ten others to reach the United States by boat, ignites a media storm. The Clinton administration is faced with deciding whether to allow the child’s Miami relatives to keep him, the course of action supported by Florida’s Cuban-American community, or send him back to his father in Cuba, the position of the Cuban government. After a seven-month battle in U.S. courts, a federal appellate court gives Elian’s father the power to act on his behalf in immigration proceedings. After the U.S. Supreme Court declines to review the case, Elian is returned to his family in Cuba. Venezuelan President Hugo Chavez signs an agreement with Castro allowing Venezuela to send oil to Cuba at a heavy discount in return for Cuban support in education, health care, science, and technology. 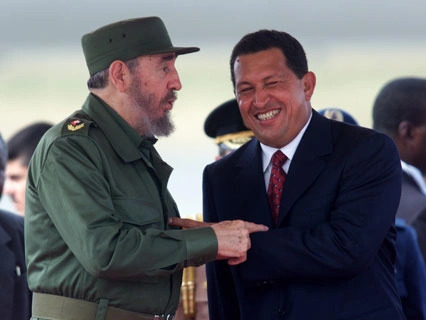 Chavez aligned himself early on with Castro’s anti-U.S. stance and, soon after taking office in February 1999, announced a government overhaul of state oil giant PDVSA, the largest foreign supplier of oil to the United States at the time. In ensuing years, Venezuela boosts its oil exports to Cuba in return for more technical personnel from Cuba, including physicians, teachers, and other social-service workers. President Obama eases restrictions on travel and remittances, which had been tightened by his predecessor. 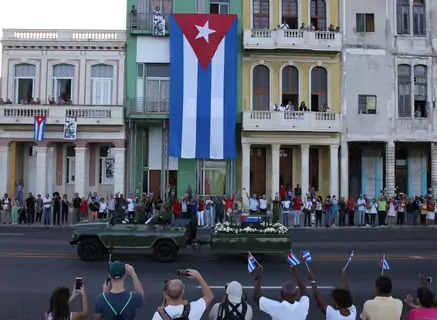 The move allows Cuban-Americans to send unlimited funds to Cuba and permits U.S. citizens to travel there for religious and educational purposes. The step is widely considered the most notable move yet toward normalizing relations, though the trade embargo remains in place. Alan Gross, a subcontractor working on a democracy-promotion program for the U.S. Agency for International Development, is arrested in Cuba. Gross was bringing technology to help Cuba’s Jewish community gain access to the internet, which is heavily restricted on the island. Havana considers the U.S. agency’s activities subversive and illegal, and in 2011, Gross is convicted of attempting to “undermine the integrity and independence” of Cuba and sentenced to fifteen years in prison. 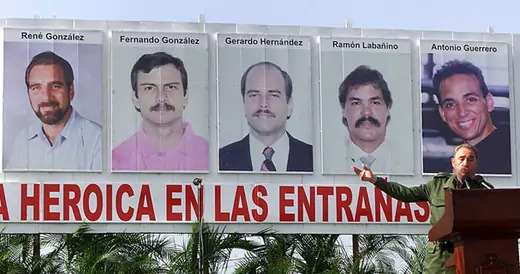 Barack Obama and Raul Castro announce they will restore full diplomatic ties following the exchange of a jailed U.S. intelligence officer for the three remaining Cuban Five prisoners. 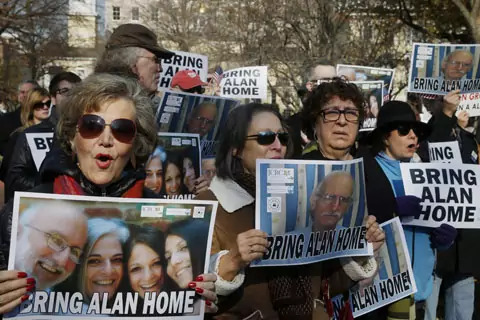 U.S. subcontractor Alan Gross, imprisoned since 2009, is also released. 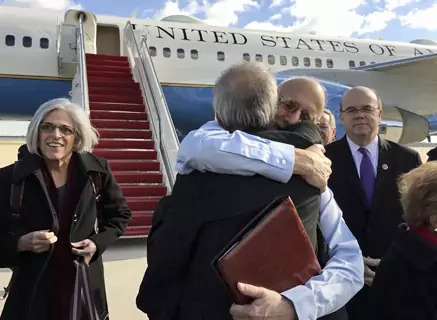 The prisoner swap and release of Gross comes after nearly eighteen months of secret talks between U.S. and Cuban officials that were brokered, in part, by Pope Francis. 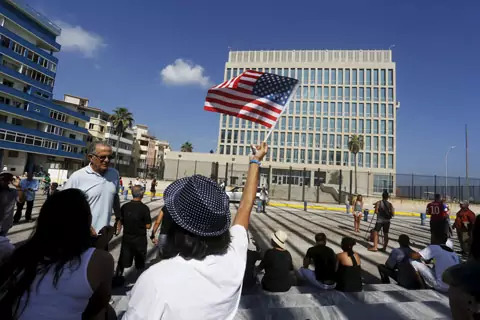 Obama says the United States plans to reopen the embassy in Havana, while members of the Republican-controlled Congress condemn the move and vow to uphold the economic embargo. The U.S. State Department removes Cuba from its list of state sponsors of terrorism. 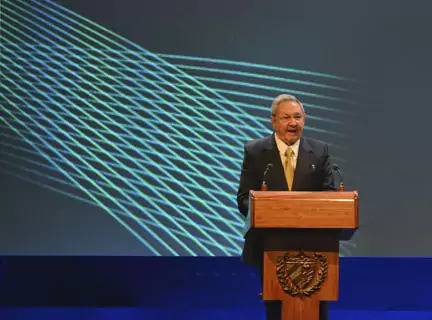 The designation, first imposed in 1982, had prevented Cuba from accessing international finance and was a sticking point in U.S.-Cuba talks on normalizing relations. 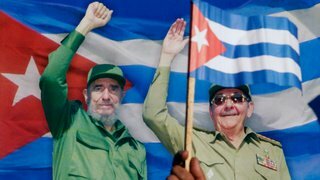 Obama had called for Cuba’s removal from the list in April, after the State Department found that Cuba had not sponsored terrorism in recent years and vowed not to do so in the future. 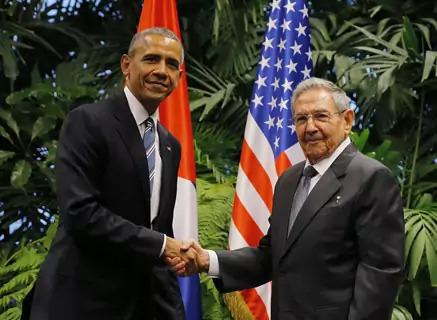 Obama's announcement came days after he met with Raul Castro on the sidelines of the Summit of the Americas in the first face-to-face discussion between U.S. and Cuban heads of state in more than half a century. 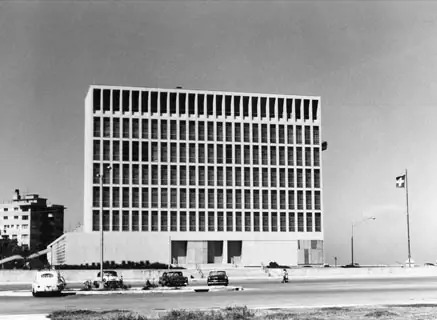 The United States and Cuban embassies, which had been closed since 1961, reopen. The U.S. trade embargo, which cannot be lifted without congressional approval, remains in place, however, and neither country names an ambassador. The top U.S. diplomat stationed in Havana is the charge d’affaires, Jeffrey DeLaurentis, while Cuba’s foreign minister, Bruno Rodriguez, oversees the reopening of Havana’s embassy in Washington. Obama becomes the first sitting U.S. president in nearly ninety years to visit the island nation. 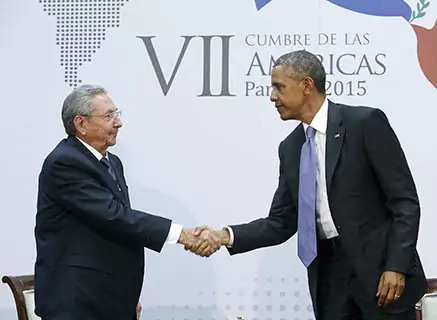 Obama meets with Raul Castro, as well as dissidents. His trip comes a month after Cuba and the United States signed an agreement to allow commercial flights between the two countries for the first time in more than fifty years. The first passenger jet flight takes place in August, and in the weeks that follow, several U.S. airlines begin service to Cuba. 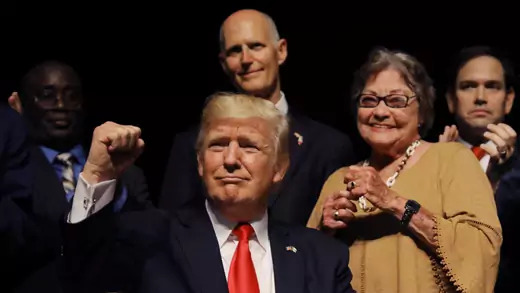 President Donald J. Trump announces that he will reinstate restrictions on Americans traveling to Cuba and U.S. business dealings with a military-run conglomerate but will not break diplomatic relations. The Obama administration’s loosened restrictions “do not help the Cuban people—they only enrich the Cuban regime,” Trump says, adding that U.S. sanctions will not be lifted until Cuba frees all of its political prisoners, respects freedoms of assembly and expression, legalizes opposition parties, and schedules free and fair elections. Some U.S. business leaders and members of Congress criticize the move, saying it will further isolate Cuba and worsen the economic and political situation there. Cuban leaders say the changes “contradict the majority support” of Americans. The policy leaves in place new direct flights from the United States, cruise ship routes, and hotel ventures. 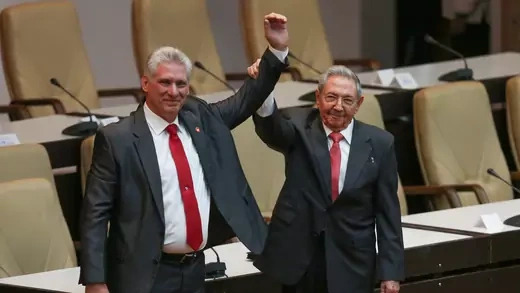 The National Assembly unanimously elects fifty-seven-year-old Miguel Diaz-Canel, first vice president and Castro’s handpicked successor, as president of Cuba. 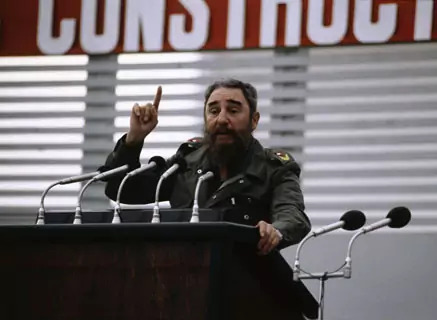 Castro, who announced in 2013 that he would not seek reelection at the end of his second term, says he will remain the head of the Communist Party until 2021, a move that preserves his political influence. The transition marks the first time in the sixty years since the revolution that the island is not ruled by a Castro.